9:15 a.m. Sunday School: Ages 4 to 6th Grade. Parents encouraged to participate. Sunday 9:15 a.m. and Wednesday 6:00 p.m.
Our confirmation program is “Head to the Heart” or H2H. 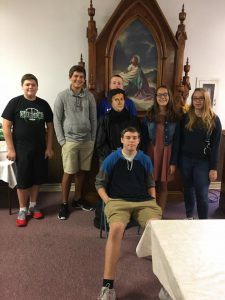 This 2 year program for 7 & 8th graders covers the small catechism and church history on Wednesday nights. Sundays students study Biblical lessons. To enhance learning, activities and events outside the classroom take place. Learning should move from the head to the heart and be seen in what our hands do. Fill out the Sunday School Form below to register your kids.